Bali is also known as the island of the gods is also popularly called the island of a thousand temples. Because, it is not difficult to see the temples there. Even in almost every corner of the region of Bali you can find temples. But of the many temples are there, there is one temple is unusual and quite mysterious. The mysterious Temple is located in Tabanan. The unique things of this temple is in it contains a statue of the statue of the Leak – spooky. Leak is one of the mythological character who is very popular in Bali. Leak is described as having a face that is creepy. In Tabanan, one of the attractions of the coast are quite reliable there are the beaches of Yeh Gangga. The beach, it is not so interesting at a glance with sand beaches are black and the weather is hot. However there are large rocks which make it look unique and different. Moving towards the East Coast Yeh Gangga, the saa is a small waterfall and Hill green. After enjoying the beauty of the waterfalls and the green hills, tourists will usually go to the beach in the East. On the beach there is a looming like a miniature stone temples at Tanah Lot. But to get there, You had to cross the river is quite deep. If you don't want to use the boat, there was no line for a vehicle but you should turn the direction and back again to the mysterious Temple are on the line. In the motorcycle parking area, there are staircases are decorated with carved snakes. At the end of the stairs, there are two statues which are on each side of the right and left. Both the same statue – just look creepy, even-length, long-haired, have fangs, and his tongue is also long. The statue is almost equal to the figure of the Leak usually told by people-people in Bali. 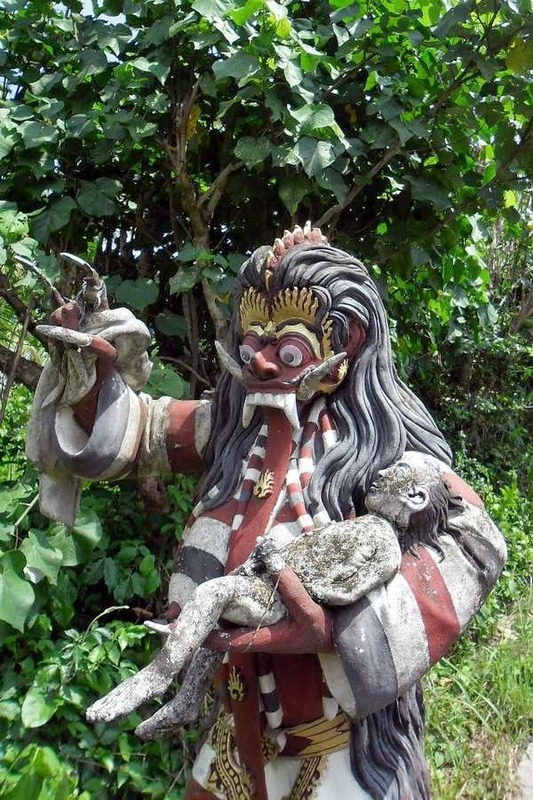 According to the mythology of Bali, Leak is a witch who is no good or evil. The word ' Le ' on the Leak means witch while the word ' ak ' means bad or evil. Staircase decorated with a carving of a snake and a statue of the Leak would make the traveller feel curious to learn more how the atmosphere inside the temple. In the area of the temple is also there are several other sculptures are unique in design. Unfortunately, in the temple there is no information on the name of his son.